Anissa Helou beat me to it with her blog post about today’s culinary collaboration! Anyway, here’s mine. Anissa (a brilliant cook and food writer specialising in Middle Eastern culinary cultures) and I had been planning a joint Sino-Lebanese lunch for months, and we finally did it, sort of, because in the end it turned out to be Sino-Moroccan. I was in charge of the first course, Anissa of the main course and dessert. 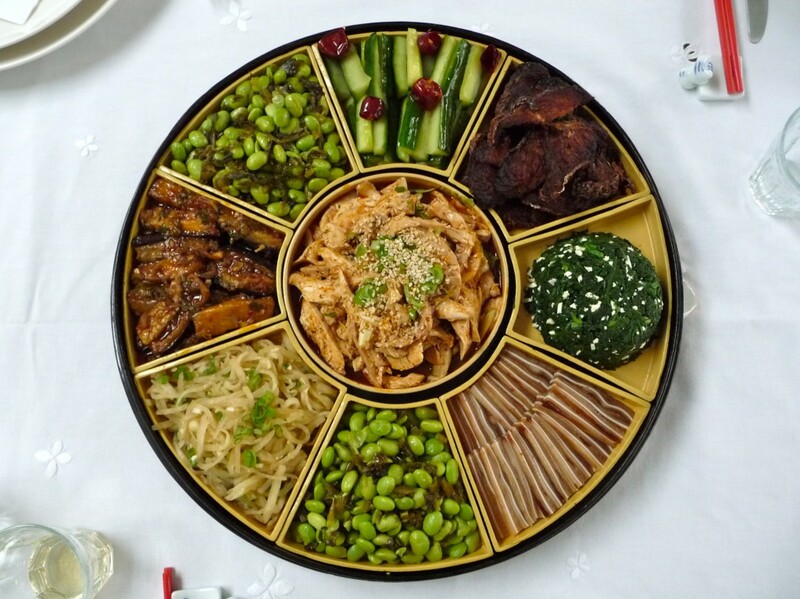 As I was cooking at home and planning a ‘Chinese takeaway’ delivery to Anissa’s place, it seemed like a good opportunity to use one of my Sichuanese cuan he ( 攒盒), the gorgeous lacquered boxes that are sometimes used for banquet appetisers. 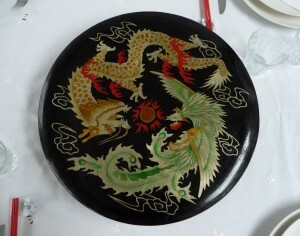 Each box comes with an ornamented lid – in this case a dragon and phoenix (see below), and a neat jigsaw of detachable compartments for the food. The smallest boxes have one central compartment with four others around: this is known as a ‘five-colour’ box. The one I used today is a ‘nine-colour’ box, although I cheated slightly because I only made eight dishes (as you can see, one is duplicated in two compartments). 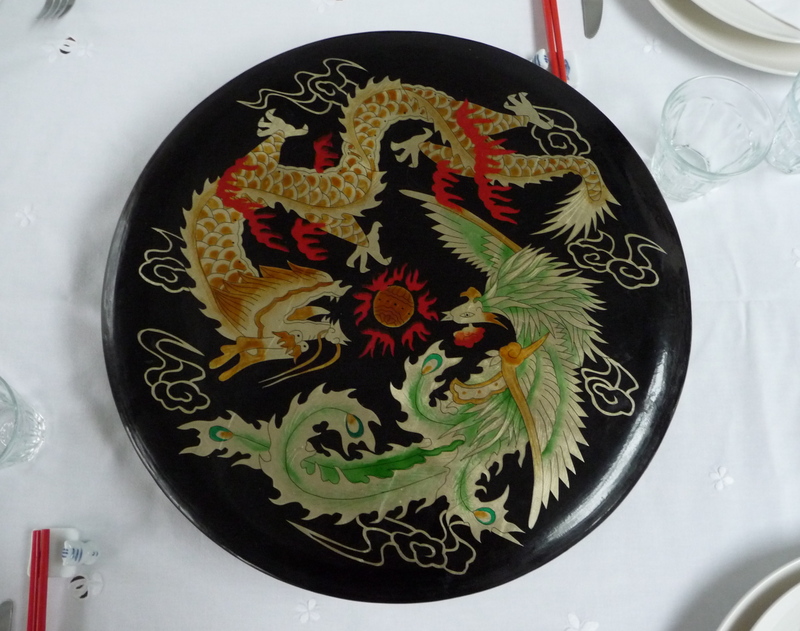 These boxes bring a real sense of occasion to a meal, because you can present the box intact and then remove the lid with a theatrical flourish. With a small group, as we were today, you can just help yourself from the compartments in the box. If a larger number of people are gathered around a big round table, a waitress will often display the whole box, and then remove the compartments and distribute them around the edges of the ‘lazy susan’ in the centre so that everyone can reach them. Today’s menu was: spicy Sichuanese chicken (凉拌鸡), green soybeans with pickled ‘snow’ vegetable (雪菜毛豆), spicy cucumber salad (炝黄瓜), Shanghainese ‘smoked’ fish (熏鱼), kohlrabi salad (香油苤蓝), garland chrysanthemum leaves with firm tofu (豆干蒿菜), fish-fragrant aubergines (鱼香茄子) and pressed pig’s ear (顺风耳). I have my friend Jason’s mother to thank for the fish dish, as she taught me the recipe (see my blog post A Shanghainese dream). Fish-fragrant aubergines are normally served hot, but I think they are glorious served as a cold dish, like a Sichuanese reply to the Turkish imam bayildi. 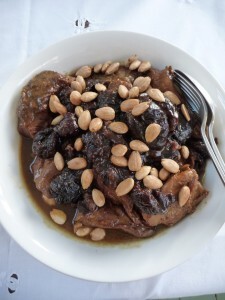 After the Sichuanese phase of the culinary symphony, we had a scrumptious Moroccan lamb tagine with prunes, almonds and honey. The lamb was meltingly tender, the honey floral and aromatic, and the toasted nuts a fabulous textural contrast to the rest. (I have some leftovers to eat tomorrow – hooray!). We ate it with home-made semolina bread. (Should you wish to make this divine stew yourself, the recipe is now on FT.com). And then some of Anissa’s pistachio ice-cream with rosewater – mmmm. Anyway, as Anissa explains on her blog, we reckoned it didn’t really work perfectly to have entire courses of each nationality, so next time we’re going to try to serve dishes from the different traditions together, as part of the same spread. Can’t wait! What a culinary treat. Whoever got to eat this meal I do envy! I would love to be able to try the combination of these two cuisines at he same time…. The presentation dish for the starters is quite something! Thanks Jason. Delighted you like it, especially as you are such a fine cook yourself! Do you like to taste Fa Cai Yu Sheng?